The wreck of a US aircraft carrier that was sunk during World War Two has been found off the coast of Australia. The USS Lexington was found 3km (2 miles) underwater in the Coral Sea, about 800km off Australia's east coast. The ship was lost in the Battle of the Coral Sea, fought with Japan from 4-8 May 1942. More than 200 crew members died in the fighting. The US Navy confirmed the ship had been discovered by a search team led by Microsoft co-founder Paul Allen. The discovery of the Lexington, along with 11 of its 35 aircraft, was made by Mr Allen's company Vulcan on Sunday. She's in mpressively good shape just like the Indianapolis was too. WW2 era steels and paints seem to hold up a lot better then earlier stuff does on the seafloor. 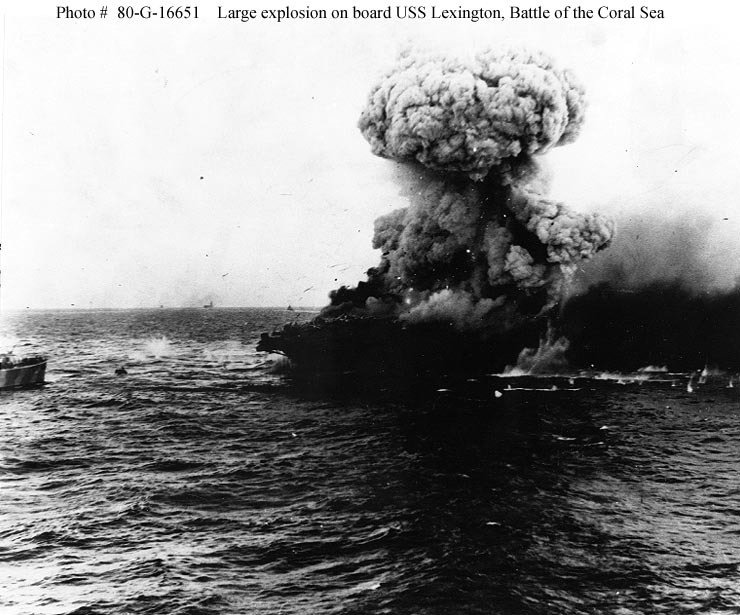 Lexington was basically lost to minor damage from each of the d the torpedoes that hit her, one of which which disabled most of her forward firemains while another caused the gasoline leak into a motor-generator room that eventually cause her explosion and resulting uncontrollable fire. Either alone might not have been fatal, and in neither cause was the direct flooded compartment damage serious. But in the process of her loss the USN leaned some pretty radical lessons about how important damage control was and would be. The explosion took place because AVGAS fumes were leaking into said motor-generator room deep in the ships bow, but that space also powered the main internal communication system. The crew sealed off the compartment but left the equipment running; it is surmised that at some point an electrical spark ignited the fumes. Once that happened the explosion blasted out all the vent trunks to compartments above and set them all on fire simultaneously. With no fire main pressure it then began spreading aft, the ship was abandoning when aircraft ordnance stored at the front of the hanger began exploding. Not much was implemented in time for Midway but in later battles USN vessels benefited immensely from having items like fog nozzles and large numbers of portable gasoline powered pumps Lexington didn't. Ships also gained increased networks of sound powered phones that didn't rely on external power to function in an emergency. One little room in a huge ship, but turned into an optimal fuel-air bomb. Looking at those plans, finding that small room was no easy task, though its proximity to the powder magazines would certainly account for what happened next. Japanese aircraft carrier Taihō met the same fate, for the same reasons. A single torpedo hit from the USS Albacore breached aviation fuel tanks, with the resulting fumes spreading to the hangar decks. Whether through inadequate training, lack of practice or general incompetence, damage control's response to it exacerbated the situation. Efforts to pump out the damaged elevator well were bungled and no one thought to try to cover the increasingly lethal mixture with foam from the hangar's fire suppression system. When simple mechanical ventilation failed to clear the air, their chief damage control officer ordered the ventilation system ramped up to full power which only served to spread the explosive vapours throughout the entire ship with predictable results. The powder magazines were not relevant as the 8in guns and ammunition of both Lexington and Saratoga had been removed on Oahu prior to the battle and were later installed in pairs on the island as coastal batteries. The bomb magazines below the powder-8in spaces though the crew was never certain got flooded; though some flooding was accomplished by dumping fire hoses down the ammunition trunks. In any case they did not explode but rather greatly concerned the ships commanders and eventual decision to abandon the forward and later aft engine spaces. The aft magazines were flooded fairly early on as was a 1000lb bomb handling room in the path of the fire. Instead what happened was after the initial fuel air blast a progressive series of further fume explosions of unknown causes, but probably linked to fuel oil leaks deeper in the ship and other material kept happening. These made it impossible to set any kind of fire boundary. Eventually a really big explosion took place in the forward elevator well most likely caused by known leaks in the rather large supply of hydraulic fluid for said elevator. That explosion reaaallly doomed the ship, as it set the forward hanger on fire and killed all remaining electrics power in the bow of the ship, which meant total ventilation failure and knocked out much of the remaining fireman pressure. Once the hanger was on fire the ship had a fatal problem in which ordnance for torpedoes and 100lb bombs was spotted at several locations around the perimeter of the hanger and due to an elevator failure the crew couldn't pitch the torpedo warheads overboard. At that point the engineering spaces were abandon and about two hours later the after located torpedo storage exploded, which is where the famous pictures of Lexington appearing to have small atomic bombs going off comes from. And the point at which the ship was ordered scuttled even though she barely listing and barely flooded. By this point the ship was already abandon with 216 men killed by the attack and followup fire and explosions, but 2,735 saved. From what I've read in the past decade it's actually a bit mythical that the Japanese did that with the powered vents; truth is nobody is sure. But they probably did smash out portholes on the enclosed hanger deck which was definitely a bad idea. Really though the ship was poorly designed on fuel storage. And not alone in the IJN. The problem with all the modern Japanese fleet carriers, though not the battleship conversions, was that they did not protect the AVGAS tanks with the TDS at all! They had a gap between the double hull and the tank walls, and that was it. Which meant in the case of Taihō they didn't just have a fume leak. They had literal AVGAS flooding into the elevator well, like literally the ship now had a sloshing open tank of AVGAS on board, as the bottom of the well was lower then the ships waterline. They are kinda lucky the torpedo didn't just detonate the entire AVGAS storage system in the first place; this appears to have happened to one or two other Japanese carriers. We know the Japanese were trying to pump the elevator well contents overboard, but functionally that meant pumping out the entire forward AVGAS system while it was actively flooding from the ocean. We also know they didn't use a foam system they had, but I'd point out that foam supplies are limited on any ship and I'm not sure how much that would actually stop fumes forming with such a huge open pool of gasoline in play. In contrast on Lexington the AVGAS was actually stored inside the TDS proper in many small tanks; flaws with the arrangement of tank voids may have contributed to her leak but this would have been contrary to an existing order, while on US and British fleet carriers designed from the keel up the AVGAS was typically in armored tanks located behind TDS protection.